I am often asked this, or some version of this, question especially by newer or would-be collectors of stretch glass as well as resellers of antique and collectible glass. The answer, as you will see from the galleries of photographs linked below (a small sampling of which are included on this page), is a resounding YES! 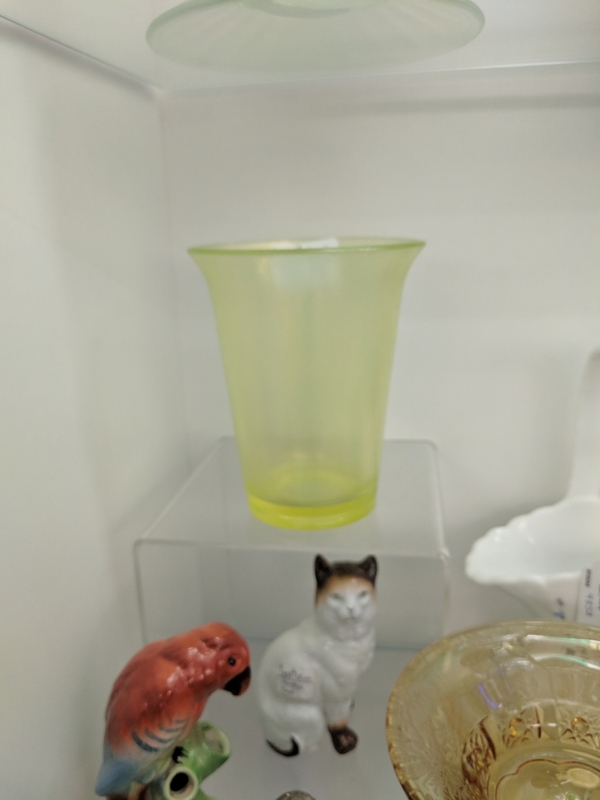 Over the past 12 months, I made a concerted effort to take photos of stretch glass I saw being offered for sale in antique shops & malls, auctions, flea markets, antique shows, etc. where I was present. My travels during this time have covered much of the northeast plus various areas of New York, Pennsylvania, Delaware, Maryland, Virginia, West Virginia, Ohio and the Carolinas. During the past 12 months there have been a few auctions which included large amounts of stretch glass and at least four auctions primarily devoted to stretch glass. These include the Tom & Debra Burns auction of a private stretch glass collection in November, 2017; an auction of glass de-accessioned from a museum in October, 2017; the Bill Crowl estate auction (Randy Clark, auctioneer) in March, 2018; and the Stretch Glass Society Annual Convention Auction by Tom & Debra Burns in July, 2018. In addition to these auctions, Mathew Wroda, Jim Seeck and other auctioneers regularly offer stretch glass in their auction sales. 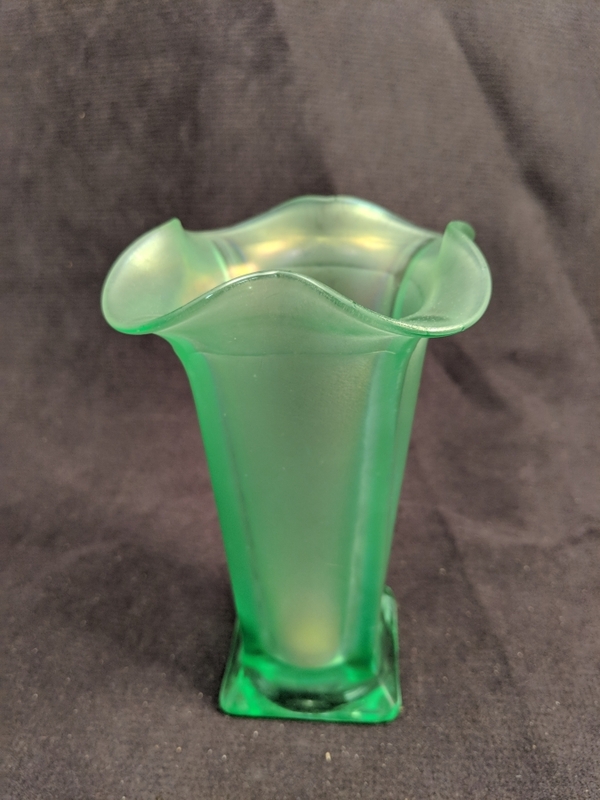 Some of the stretch glass offered in these sales is included in the galleries linked below, but much of it is not; see the respective linked pages for additional photos of glass offered at these events. In addition, eBay and the other online offerings of stretch glass are also not included here. On any given day, you will find more than 100 pieces of stretch glass for sale on eBay – and that doesn’t count all the non-stretch glass which is offered for sale as stretch glass. And there are private sales of stretch glass which occur regularly, including estate sales, yard sales and sales between collectors. 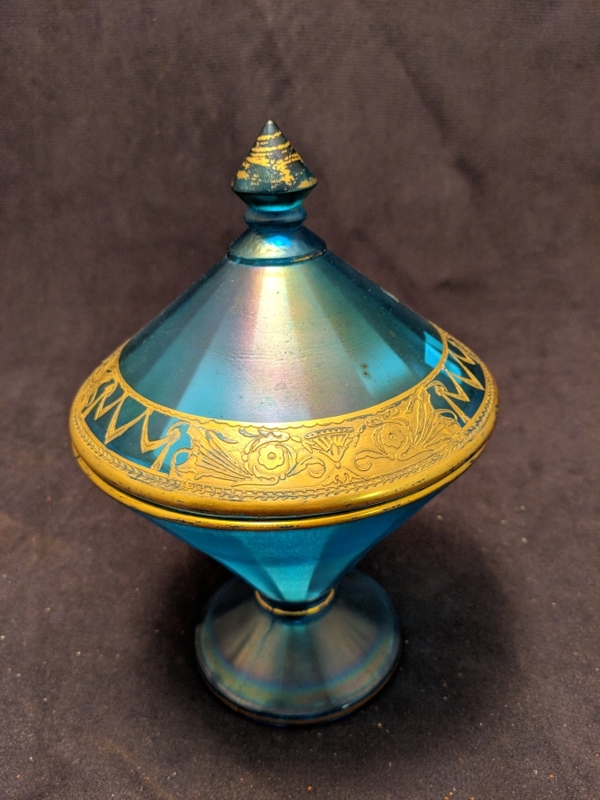 Finally, carnival glass auctions often include from a few to many pieces of stretch glass. All these sales add up to a significant amount of stretch glass changing hands during the past 12 months. If you are a collector – or would-be collector – there should have been an adequate supply of stretch glass being offered for sale to satisfy your collecting interest and allow you to build a substantial collection of stretch glass. This is not to suggest that stretch glass rarities are readily available for the taking or sitting on the bargain shelves. As with any antique or collectible, the rarities are still challenging to find, but not as challenging as they were in the recent past, as is evidenced by some of the items which were sold in the past 12 months. Stretch glass is becoming a more widely recognized antique and collectible glassware and the demand for stretch glass by a growing number of collectors is resulting in more resellers offering stretch glass for sale. You may be asking, “How do I find out where and when stretch glass is for sale?” One of the benefits of belonging to The Stretch Glass Society is the announcement of auctions and glass shows/conventions where stretch glass is offered for sale which appear regularly on our website and in our newsletters. The network of SGS members is also a valuable source of information. I encourage you to consider joining The Stretch Glass Society, if you are not already a member, to gain knowledge of when and where stretch glass is going to be available for purchase. Beyond this information, a search of the internet will lead you to auctioneer websites, eBay and other virtual locations where stretch glass is being offered for sale. Please take a look at the photos in these galleries to get an idea of how much stretch glass was available for sale in the past year. If you have been a buyer or seller and would like to contribute photos of your stretch glass (purchased or sold) to enhance this feature, please send them to photos@stretchglasssociety.org and we will include them in a future update. Thanks for your interest in stretch glass and happy hunting.